As an Asset Manager or Boiler Engineer in a plant with high pressure piping, you know there's a lot at stake. Major failures in high pressure piping systems can result in personnel injuries and fatalities, damaged equipment, costly loss of production, and massive liability fines. Prevention is always better (and cheaper) than cure, so don't ignore your high pressure piping system until it's too late. At HRL, we provide a comprehensive high pressure piping inspection and maintenance program, ensuring the integrity of your piping system to prevent future failures and protect your plant. 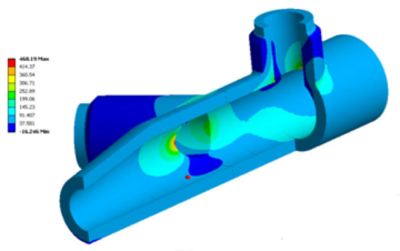 With a proven track record serving businesses like Synergy, AGL, and NRG, we deliver unmatched high pressure piping expertise, cutting-edge modelling software, and high-level analysis and reporting. 6. Overall Program Report: All work completed is documented in a thorough technical report detailing the work undertaken and the maintenance program moving forward. After every stage, we deliver a comprehensive technical report detailing the work done, the findings gathered, and our recommendations regarding next steps. You can engage us to implement the entire program end to end, or certain stages as required. The reliability of your statutory equipment, avoiding unexpected outages, urgent repairs, and months of lost operation. In fact, the cost of this work is usually less than half a day's lost operation!